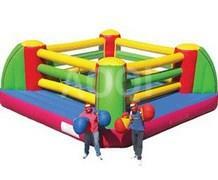 Inflatable boxing or wrestling ring. Includes 2 sets of oversized gloves and 2 sets of headgear. This unit requires 16ft x 16ft x 8ft in actual space, power within 50ft of a dedicated electrical outlet free of glass, rocks, sharp objects, dog bombs, tree limbs/branches, gutters, etc.